Scientists have long considered the possibility of creating ultra-tall space elevators that stretch beyond the earth’s atmosphere to transport satellites and shuttles into outer space without the cost and environmental impact of rocket fuels. 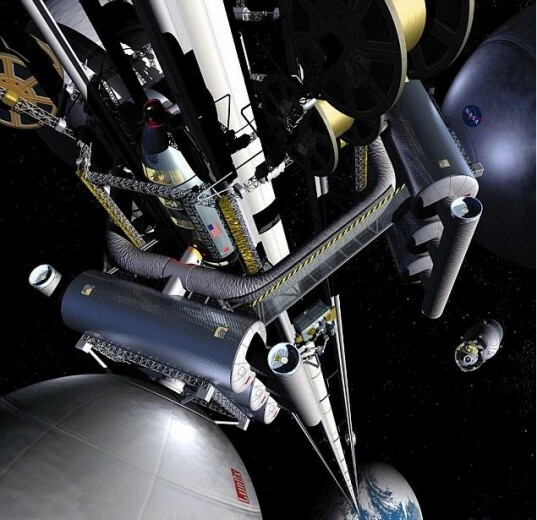 Now a Japanese company specializing in major infrastructure projects called The Obayashi Corporation has announced plans to build a space elevator by 2050, with the aim of taking tourists 20,000 miles above the planet’s surface. The project is still at the planning stage, but it would see the construction of a spaceport on the planet’s surface with an accompanying space station 22,000 miles up in geosynchronous orbit. The two would be connected by a cable (possibly made from carbon nanotubes due to the material’s strength and light weight), which would extend a total of 60,000 miles into space. This would serve as an orbital counterweight in order to hold the cable up. The Obayashi Corporation’s elevator is designed to take 30 passengers at a time into space at a speed of 125 miles an hour – however this means the trip would still take 8 days. (Can you imagine spending 8 days in an elevator with a bunch of strangers?) Of course, the proposed elevator would also include living quarters and laboratories. Zero gravity would also add to the experience and would kick in after about 5 days into the journey. As previously mentioned, carbon nanotubes are the primary material that will be used to make the elevator cable – but currently they are not strong enough. However considering how fast technology is being developed, especially with genetically-modified spider silk, it could be possible to construct a super strong cable by 2050. There is one small problem – the space elevator could cost over $9.5 billion, and it’s anyone’s guess as to how much the tickets would cost. Now this sounds like a viable project. I don't know how they would keep investors committed long enough to complete it. Even governments have problems with this kind of time frame. Flight seems more practical and faster. I also thought about space junk damaging this structure and proneness to terrorist attacks. 60,000 mile long cable? it sounds like they intend to make it past the Lagrange point (34000 miles) so that the whole thing is held in place by gravity. That would be a lot of steel and carbon nanotube cabling to a structure 22 Thousand miles up. That's nearly the circumference of the earth, with the associated infrastructure in a type of construction never been done or significantly attempted. You'd sooner see a permanent habitation on Mars or the Moon. Ummmmm..... does anyone really think this would only cost $6 billion? The tallest building in the world is about half a mile tall. They're proposing building something 120,000 times as tall as anything humans have ever built, out of materials we have difficulty producing more than a few grams of at a time. Good luck with that. Actually $6 billion does not sound that bad considering the numbers being thrown around by company earnings reports and national debts. I'm sure the world bank has that kind of cash floating around somewhere. Scientists have long considered the possibility of creating ultra-tall space elevators that stretch beyond the earth’s atmosphere to transport satellites and shuttles into outer space without the cost and environmental impact of rocket fuels. 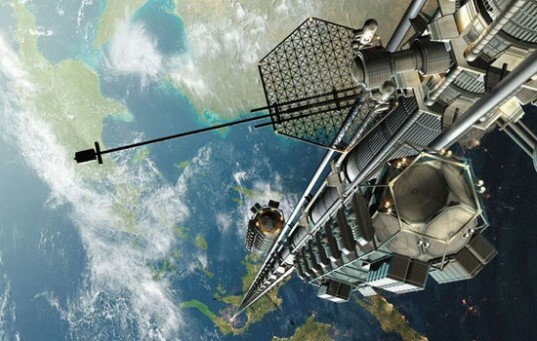 Now a Japanese company specializing in major infrastructure projects called The Obayashi Corporation has announced plans to build a space elevator by 2050, with the aim of taking tourists 20,000 miles above the planet's surface.